West Chester, OH; November 2018—Color-Logic has certified the Skandacor SLEEKpro™cold foil system. "The Skandacor printed test results of the Color-Logic test form files were stellar," stated Color-Logic CTO Richard Ainge. 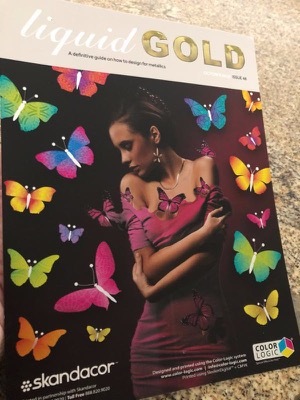 "The decorative effects and colors produced using the Skandacor cold foil system will enable Skandacor printers to differentiate what they can provide their clients." Ainge continued: "The Skandacor cold foil system, together with the Color-Logic Process Metallic Color System, enables printers using CMYK digital presses to provide their clients with 250 predictable foil colors and unlimited decorative effects while using just one silver-based foil, making it also economical for printers to produce luxurious special effects for their clients." Color-Logic™ develops color communication systems and software tool sets for a variety of special effect printing applications. Color-Logic provides brand owners, product managers, corporations, and their advertising agencies the ability to differentiate themselves and their clients with a simple print production process that yields dramatic results. Color-Logic decorative effects utilize the existing workflows of printers and designers, yielding dynamic results without the use of special equipment. Color-Logic supports the value of print and works with designers and printers to enhance their printed media. For more information, call +1-513-258-0047.